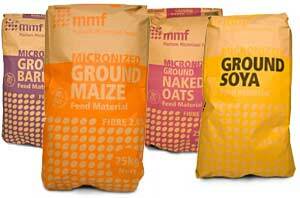 A key to MMF's success has been the ability to deliver consistently high quality products to exacting specifications. Micronized products provide improved nutritional value over feeding the same materials uncooked. Increased available energy and improved digestibility are both achieve due to the gelatinisation of starch molecules during the cooking process. This is particularly beneficial in starter diets for young animals and poultry. Pelleted products allows many raw materials to be combined in relatively small quantities to create a nutritionally balanced feed. Micro-additions of high value minerals can be incorporated and even distribution throughout the mix can be assured. Pellets are an excellent way of delivering high quality balanced nutrition to animals either as a complete feed or as a component in a diet.